The different grounds visual aid included. In today's lesson, Jesus was sitting by the Sea of Tiberius. There were a lot of people standing on the shore because they wanted to hear Jesus speak. Jesus went onto a boat and sat down to talk to them. 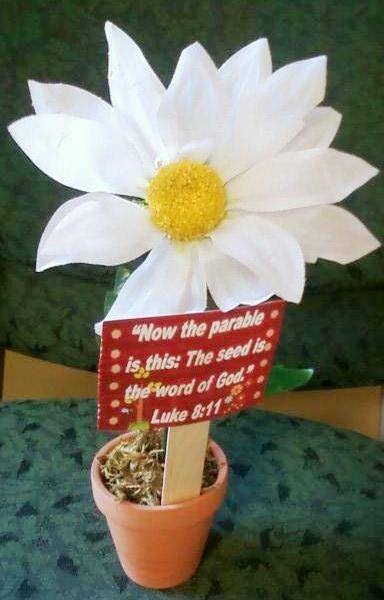 Jesus taught many lessons using parables. A Sower, being a person that is planting seeds or a farmer, is sowing seeds. (Pretend to reach inside the bag and throw out seed.) In Jesus’ time, farmers didn’t have the farm machinery we have now, so the farmer would have a sack with seed. He would walk across the field throwing it to plant it. So as the farmer threw the seeds some fell on the hard path of ground that had not been plowed or where people had walked and made the ground hard. Because the seeds couldn’t sink into the dug up dirt, the birds came and ate the seeds. Some of the seeds fell on stony (rocky) ground. It had a thin layer of dirt on top but stones underneath and unable to get a good root. Those seeds grew fast, but when it became hot, they died right away. (Some of the seeds fell into thorns. The thorns grew up and choked the seeds. But the other seeds fell on good ground. It brought good fruit. Jesus doesn’t expect us to all bring in the same fruit, like bringing the same number of friends to Worship Service, or teaching our friends about Jesus. He does expect us all to do the best WE can! Everyone we meet is different, same as the different soils that the seeds were planted in, people we teach will react different. Think about your friends, or neighbors, or family that you might tell about Jesus. 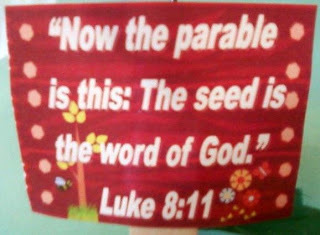 God's Word, the Bible is the seed Jesus is telling us about. 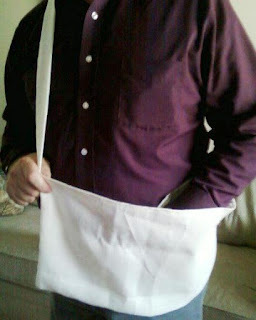 I made this sower bag (my husband is wearing it so I could take the picture!). Super easy to sew. I made the strap 4' long and 3" wide. The fabric is a type of burlap, I just happened to have it from some other project. I cut the fabric 24" X 30", folded it half so it is long with right sides together. I sewed the 2 sides together, then folded and sewed the edge round the top to finish it off. I folded the strap edges toward the center, (fold over one end to cover salvage if necessary), then attached to the sides. As I told the Bible lesson, I pretended to "sow the seeds". simple, but great for this age group! While I talked about the last soil, the good soil, I handed out fruit snacks from the bag, of course, they loved that! Just a note, the strap is long, and I knotted it in the back for me. I wanted it changeable for others that might help me. These are Ziploc plastic containers. I added dirt in each. The first was dirt with a lot of clay, and made it hard on top. I added seeds on top and pretend birds. The second I added rocks and artificial flower stems w/o the flowers. The third one had straw-like vines and thorns. The last had the good ground they could run their fingers through and green artificial plants. I would probably add a healthy green plant, but just wasn't thinking clear today! (1) Some will be like the hard soil, will not listen and brush off what you tell them about Jesus. They are too worried about their life and activities that they are involved in. (2) Some, like the stony ground, will listen and be baptized, then fall away. (3) Others, like the thorns, won’t want anything to do with you or Jesus. (4) Then you will have those like the good soil. The seed will get planted and they will grow. They will listen, study the Bible with you and learn, be baptized and be faithful telling their friends about God. Jesus ended the parable by saying he who has ears, let him hear (we have 2 ears!). Jesus wants everyone to listen to His words. But not everyone will do His will. This is the take home project for the lesson today. Everything from Dollar tree, 3 pots for $1.00, the flowers, green potting foam inside the pot, (I added Aleene's Tacky Glue on foam before adding the moss), and the moss. Print the sign here and attach it to a large craft stick. I used this printable with the lapbook/workbook. The teacher's download has all the grounds in place like the photo. The students has the 4 grounds on the next page for them to cut and glue. This is the lapbook printable for this lesson. Thanks so much for the nice comment! It is appreciated! Oh My! 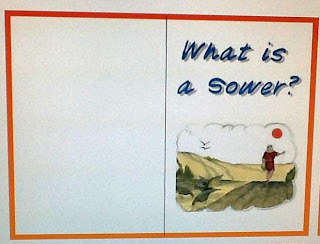 I was looking for ideas to wrap up my lesson on the Parable of the Sower and this is awesome!!! Thank you so much for taking your time to do this. God Bless! Thank you very much for this awesome lesson and all your work, very helpful for my class! Thanks for visiting! I am glad you have found some ideas that you can use! Thanks so much for the nice comment! Thank you for the awesome lesson and your work, very helpful for my class. GOD bless you! I saw the 4 pictures of the seed and ground type and instantly thought ... science fair project. Wonderful project to move from hypothesis to conclusion! Wonderful! Thank you so much for the ideas! Thank you for sharing. I really like the containers. I think you may want to look at the thorny soil again though. You wrote, "They won't want anything to do with Jesus." But what I read is that they hear the word but get choked by anxiety and cares if this world and riches. So it's similar to the rocky soil, but instead of persecution it's being distracted by things of the world. They are not seeking first the kingdom of God. They grew a little while, but it didn't last. See Luke 8. Love this! You obviously put a lot of time and care into it. Love the bag AND the fruit snacks at the bottom! Thanks for sharing.